When Mark Cavendish finished stage 11 of this year’s Tour de France, they were clearing the barriers away. Podium ceremonies had been and gone and the new yellow jersey, Geraint Thomas, was busy doing a press conference. “I tried. I finished. I was just nowhere near fast enough,” said the man who at this point it seems wholly inappropriate to call the Manx Missile. The Manx Mobility Scooter would also be unfair. Cavendish rode alone and quickly by human standards, but the Tour de France asks that its competitors always aspire to superhumanity. In a way, he achieved it – but unfortunately not in the way the race judges wanted. Cavendish had said before the race that for the first time in his life he was genuinely afraid of the mountain stages. He picked out the Alpe d’Huez day as being particularly terrifying, so there was at least a silver lining to failing to make the time cut a day before. Long mountain stages seem frightening, but it is actually the short ones that tend to do for the sprinters. Everyone in the Tour de France has to finish within a certain percentage of the time of the winning rider or they’re excluded from the race. It is only when the climbers are really racing that the sprinters fall behind – but on a short parcours that might mean most of the stage. Stage 11 was a 108.5km clip through the Alps over three sharp peaks, so the speed was high from the outset. However, it is also on these stages that Peter Sagan builds his enormous lead in the points competition. Day after day, he repeats the same trick. 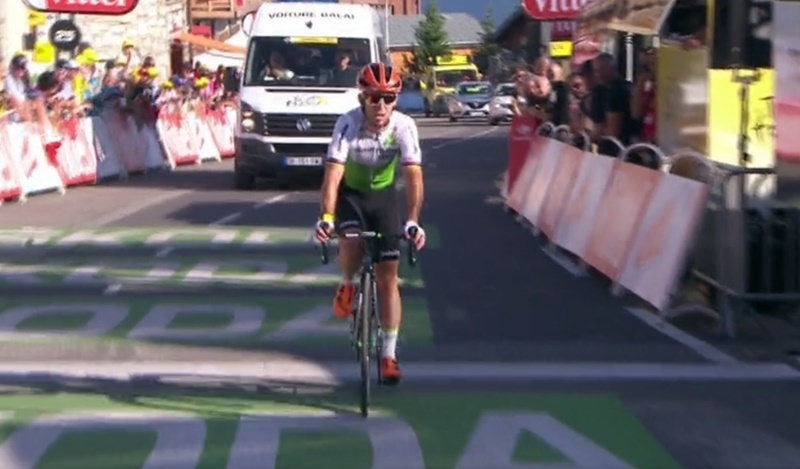 He gets into the break, takes the points at the intermediate sprint and then paces himself all the way to the finish. Why do none of his rivals do that? Because they can’t. They’re busy trying to avoid the time cut. Did you find that through the link in the article? Duh. Nope. I’d seen Cavendish mention it on Twitter just a little earlier. Don’t mind me, that’s the second time I’ve done that recently. If you missed the link, others will have too, so worth it I’d say.